You can find our yoga class descriptions, family wellness programs, or class and event calendar on the website. Our registration site is mobile friendly and is the primary way we take payments. Most of our class venues do not have a receptionist so it’s a great help to the instructor if you take care of this yourself in advance. Having trouble with our site? See tips. Want to register by mail? And don’t miss our Tips for New Students for what to expect in class itself and our Camp Frequently Asked Questions for camp-specific policies. 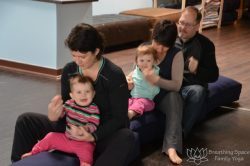 Can we do a trial class or drop into a Tot, Preschooler, Family, Kids or Tween Yoga class occasionally? Nope, sorry. We don’t offer drop-in options for classes for crawling or older children or trial classes during the regular session. Children really do need the consistency of a weekly class both for comfort and so they can best learn and drop-ins can be disruptive to the class routine. Read more. Since it often takes several classes for a child to settle in, dropping in once is not really the best indicator of whether your child will enjoy class. We have a no-risk refund policy. If you register for a class and decide for any reason it’s a bad fit for you, your child, or your schedule, and you decide early in the series, you can drop the class and get a prorated refund. See details. We occasionally offer trial/drop-in days, when the teacher will spend a little extra time explaining the class routine and parents get a chance to see a class in action. We also understand that life is unpredictable and have a generous makeup policy for families that wish to commit to a series but know they will miss a class or two. 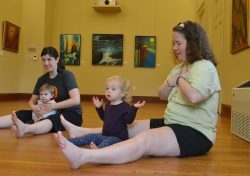 Children’s and family yoga (crawling babies to teen) is offered in multi-class series, like semesters, no drop-ins. 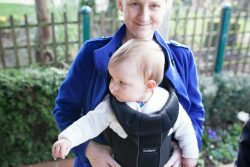 Up to two (2) caregivers may attend family classes with the registered child. The same adult need not attend every week. Siblings must be enrolled with the exception of non-walking infants or siblings on school-closed days. Should you need to miss a class in your session, we have a very flexible makeup policy.